MSC Cruises, the Swiss-based world’s largest privately-owned cruise line and market leader in Europe, South America and South Africa, and FINCANTIERI, heir to the great tradition of Italian shipbuilding and one of the largest shipbuilding groups in the world, today celebrated the float out of MSC Seaside, one of two new groundbreaking mega-ships that MSC Cruises is bringing into service between June and December 2017. 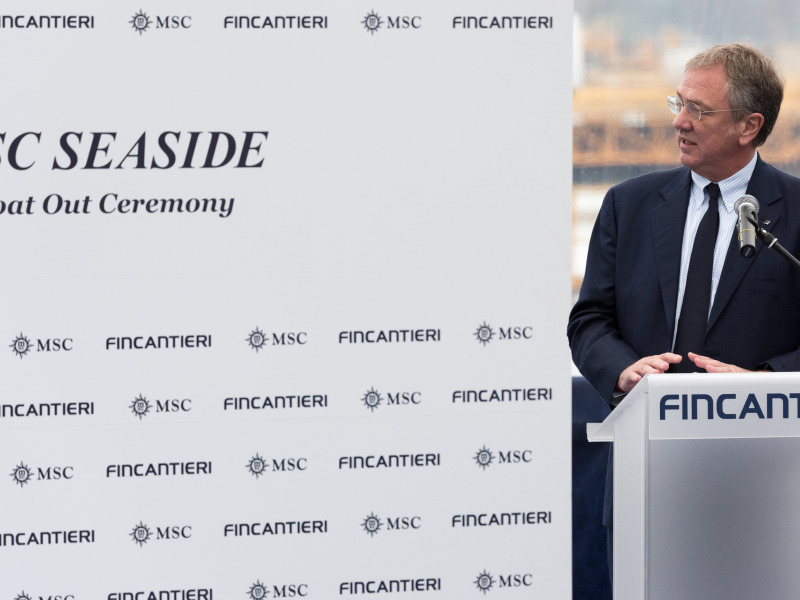 The ceremony took place this weekend at the Monfalcone shipyard, where the ship is being built. MSC Seaside will homeport in PortMiami as of December 2017 and will sail year round in the Caribbean, further enriching MSC Cruises’ offering in the region – which, with the addition of MSC Seaside, will offer a total of five of the most modern cruise ships serving the Caribbean. 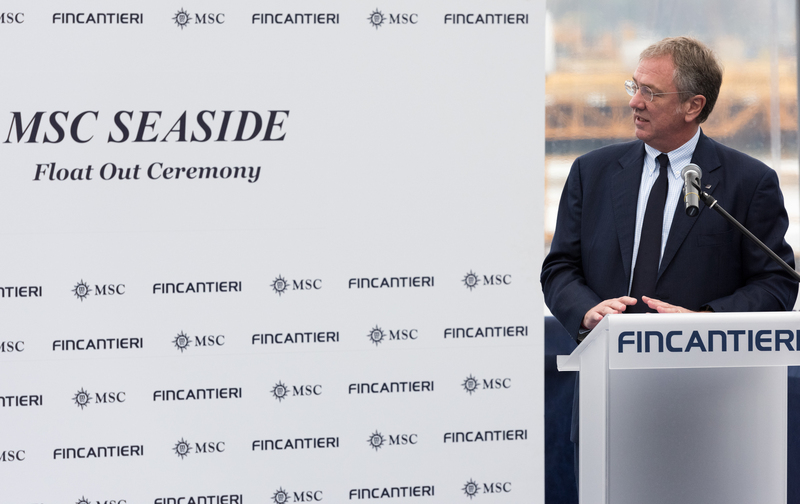 Giuseppe Bono, CEO of Fincantieri, stated: “Seeing this ship taking shape has a value which is not only symbolic for the group that I lead, and for me personally. We acquired the order for the construction of it, along with a sister ship, in 2014, at the turn of an unprecedented crisis and an equally extraordinary explosion of the market. We placed such great ambitions for this order, undertaking to give the owner a state-of-the-art product, able to meet its vision of modern cruising. Being successful with a prototype and such a recognizable design, which confirms our commercial and technology leadership in this sector, makes us doubly proud of the result”. MSC Seaside is the first of a completely new and innovative generation of cruise ships being built by MSC Cruises leading Italian shipyard FINCANTIERI. With this new prototype inspired by an elegant beach condo, MSC Cruises has pushed the boundaries with its bold design concept and demonstrates the Company’s continued commitment to put the guest experience at the centre of all innovation and product development. Every element of the ship is designed to bring the guests closer to the sea with special design features such as a unique 360° ocean level promenade, panoramic glass lifts, a VOILIE breathtaking 30-metre bridge on the top deck and, with 76% of the cabins positioned on the outside of the ship, guests will never be far from a view of the ocean. On board MSC Seaside, the dining experience has been designed to inspire and delight with a huge choice of Mediterannean and international cuisines served in 11 different dining venues including five speciality restaurants. Of these, one is a Pan-Asian restaurant created in partnership with world renowned chef Roy Yamaguchi and two are buffets serving food 20 hours a day with one designed specifically for families.